Today, our work and life can’t live without computer. Computers play a significant role in our daily life. We store our life records in the computer’s hard disk with digital data type, musics, photos, movies, and other all kinds of files. If we lose these data, it will be a heavy strike in our life. So we’d better create a backup of them in advance. Windows is the one of most popular operating system in the world, either Windows 7 or Windows 10 are used by hundreds and thousands of people. To backup data, backup system first is also necessary. Because only in the normal system, you can access to these files. We need a tool which could complete all kinds of backup tasks. Windows itself has snap-in backup program, but it has some limits and is not easy to handle. Third-party backup software could make up these disadvantages. AOMEI Backupper is a reliable one. It has system backup, disk backup, partition backup, file backup and even file sync under Backup tab. What’s more, the feature of incremental and differential backup can protect the system continuously for they only work on the changed part compared to the previous particular backup. Select the right backup strategy not only save time, but also save space. Users usually make a full backup first, incremental backup or differential backup later depends on their situations. If you want to do restore. AOMEI Backupper allows you to do universal restore and selective file restore. 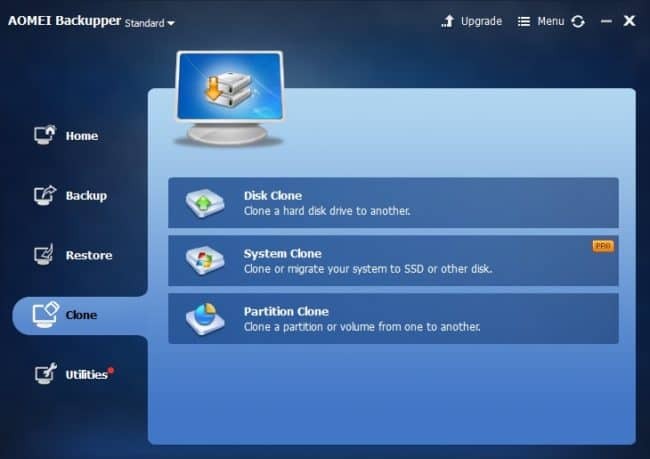 Except backup and sync, AOMEI Backupper also could realize cloning disk, partition or system to upgrade hard disk / system without reinstallation. You see, when you plan to change a hardware or update Windows 7 to Windows 10, AOMEI Backupper can give you a hand too. That’s not enough. 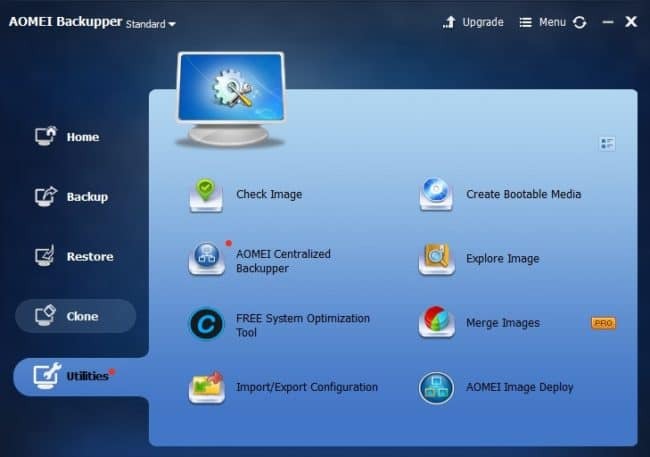 AOMEI Backupper integrates several useful utilities. From above pictures, you can see there are Explore Image, Check Image, Merge Images, Create bootable media, Image Deploy and PXE tool, etc. These tools will help you to optimize the system or manage and maintenance multiple systems efficiently, from personal use expand to enterprise use. AOMEI Backupper has several editions, for Windows 7 or Windows 10 and other Windows PC systems, the free backup software Standard Edition of AOMEI Backupper is suitable for most people. We also suggest you to try this freeware first then decide whether upgrade to high editions. 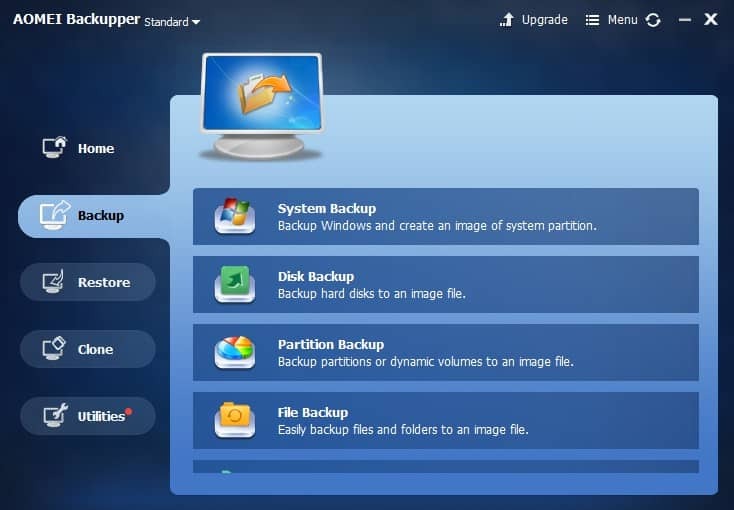 If you are looking for a backup software to protect your data and system, hope you could try AOMEI Backupper.